Zionist Union leaders vow to 'save Israeli democracy' from Netanyahu in early elections in April. Zionist Union faction leader Avi Gabbay delivered a special statement Monday evening following the announcement of early elections. "All the political players announced that they would be [willing to be] in a government headed by Netanyahu, so these are elections between me and Netanyahu," Gabbay said. He added; "I am happy to advance the elections, and these elections are especially important for the future of the state. These elections will be between those who are satisfied with what is in front of them and those who believe and who hope. Starting today, we begin to write a new story for the State of Israel. A story of success, of cooperation, of change." 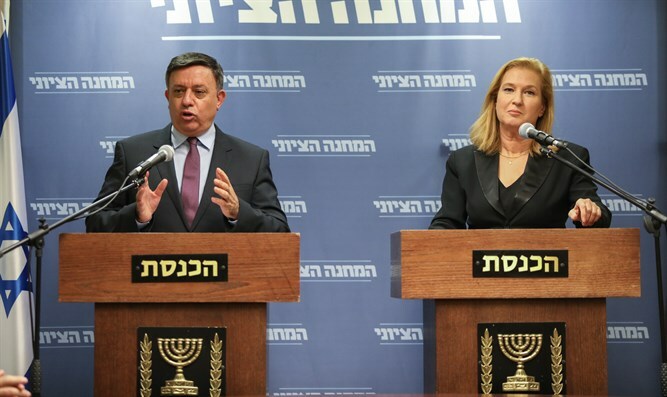 Opposition leader Tzipi Livni added: "The die is cast and I hope that the government will fall with it. Passover eve is a good opportunity to clean the chametz. Election Day should be the day of the revolution. It can happen, it must happen for the benefit of the State of Israel." "Today the hope is returning to Israel and we can breathe a sigh of relief. We can stop the legislation of annexation, the deprivation and destruction of democracy and the rule of law. From now on, Netanyahu will not try to destroy what is left of Israeli democracy, and we will stand as a wall against any such attempt," added Livni.